Jeff Smith and Scholastic's Graphix imprint announced a first picture book for the celebrated cartoonist during last night's "Preview Night" at Comic-Con International. That continues one of comics most beneficial publisher/cartoonist partnerships of the last fifty years. 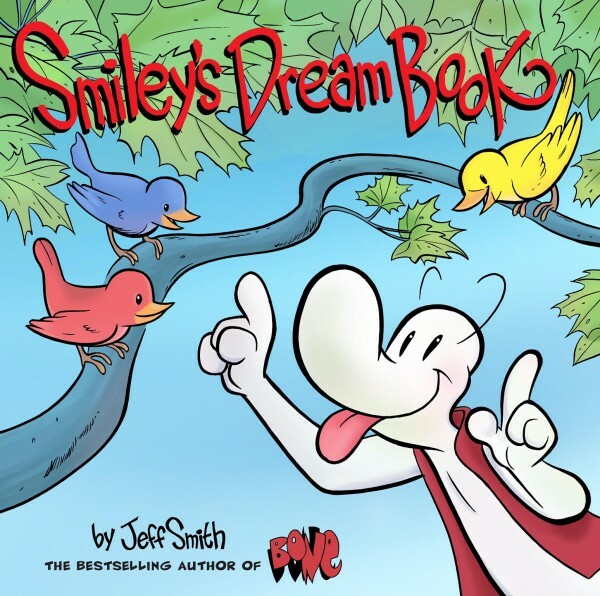 "On Preview Night at 2017's San Diego Comic Con International, Jeff Smith announced his plans to publish his debut picture book, Smiley's Dream Book (ISBN: 978-0-545-67477-5) with Graphix, an imprint of Scholastic. David Saylor, Vice President, Creative Director of Trade Publishing, and Editorial Director of Graphix acquired the book with English language publication rights in the United States, Canada, and the Philippines. Smiley's Dream Book will be the first of two picture books featuring Smiley Bone and the Bone cousins, and is slated to publish in Summer 2018." As the PR mentions, it looks like we'll get at least one more. I saw some pages of this at one point, and they're quite gorgeous.